Note: The percentages do not add up to 100% because there was an ‘other’ category that is not presented. It was 5% or less in all cases. Source: CICH graphic created using data adapted from Health Behaviour in School-aged Children in Canada: Focus on Relationships. 2016. 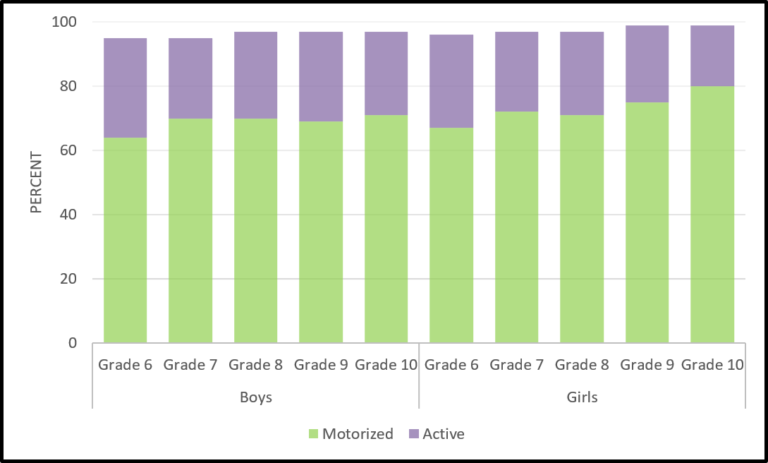 The majority of Canadian students in Grades 6 through 10 go to school in some form of motorized vehicle – between 64% and 80% depending on the grade. Only 19% to 31% report an active mode of getting to school. When children and youth use active forms of transportation – such as walking or cycling – they have the opportunity to increase their levels of physical activity. Research shows that young people who use active transportation to get to and from school attain higher levels of daily physical activity than do those who use a car or bus. There are many factors that will influence how children commute to school – distance, access to transport, etc.